So I have had a bit of a break from my blog of late, I have been crazy busy at work over the Christmas period and didn't have enough energy to think let alone blog. But now 2013 has rolled in I am making blogging religiously again one of my main priorities. Every year I make far fetched resolutions which I will have most likely broken by January 2nd. This year I'm being a bit more lenient with myself. Rather than declaring I will lose a stone in a week, I am aiming for a healthier, happier year. Come pay day I am going to embark on David Kirch's 48 cleanse to kick start my new year new me plan, but until those funds make a magic appearance I am going to start incorporating more juice into my diet. 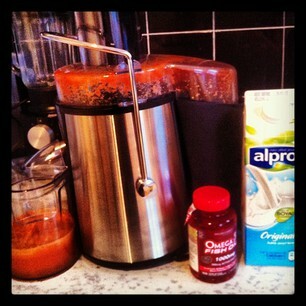 A sure fire way to get my fave a day, as it took 3 carrots and 2 apples to make one glass of juice (!). On top of the juice I want to get back to drinking more water. I used to drink approximately 13 glasses of water a day, this has dwindled down to my recommended 8 and i miss the feeling of over hydration. In my book there is no such thing as too much water. In an ideal world I would give up dairy for good, but as a bit of a cheese fiend that is not likely to happen any time soon. So to begin with I am giving up milk. To be honest i'm not thaaaat big a fan of milk anyway, and I can't taste the difference between cow and soya in my tea and coffee so score. 2012 hasn't been my skin's best year so I am hoping to have more luck in 2013, in order to push fate more firmly on my side I am going to start taking fish oil tablets. They don't come cheap, and it is more than kinda irritating having to take three a day, but if it works it will all be worth it! I also want to get back to the gym. The past two years I have been a fully dedicated gym bunny, I need to be to shift the freshers fifteen I put on in my first year. However since moving to Putney and dealing with a significant down grade in my gym my excercise has fallen by the wayside. This year I want to pick up those trainers and get back out there. Two more to go. Most of my resolutions this year are focusing on health and skin but there are a few added extras. Number one to read more. My granddad likes to get me books as my under the tree present, and I still haven't finished the ones he got me last year. However when I opened Wild Swans on Christmas day my passion for reading returned. Finally, and really what should be most importantly, find a real life adult job!